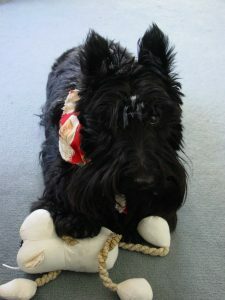 Hi folks I’m Kara – Le Petit Hotel’s new black staff member. I arrived here ex Juscot Kennels, Hamilton, in early January, after being flown via Air NZ in the dog standard crate and picked up by Bruce & Scott at Christchurch Airport. I’m adapting real fast to the busy hotel life here, and when new guests arrive at the door, I usually manage to be first to greet them, check out their shoe laces, luggage straps, and anything else that I can try out my new pearly white toofies on. If I think they are going to growl at me, I just roll over on my back and play helpless. I know Maggie left big shoes for me to fill but I’m going to do my very best. 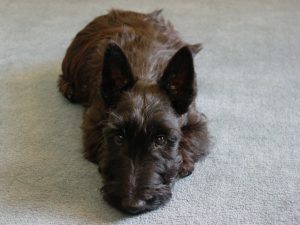 Unfortunately tho’ I’ve given Bruce & Martine a fair bit of worry already, because I inherited a strange uncommon( in Scotties) genetic problem from my parents. Essentially what happens is that my two back legs turn inwards, especially my right one, when I walk, and the effect is to make me hop when I try to run. I have to say that lots of white coated people have inspected my hind legs, they have taken lots of photos as well, and now I have just got to wait until I’m a bit older before we can have another assessment. However I know I’m in a good place here, I’ve got 24 hr TLC and I can still get from A to B very fast. I’ve grown a lot since this day one photo was taken so keep an eye out for more pictures. I need time to sus things out.